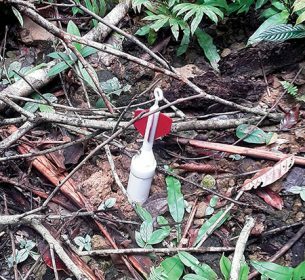 Over 50 personnel from six companies ventured to the foothills of Papua New Guinea in late 2017 for the initial field test of the deployment drones, the data recording & transmitting DARTs, and the data processing functionality of METIS. In June 2017, Total E&P Research & Development, along with Wireless Seismic, Inc. (WSI) and Geokinetics Inc., announced the development of the next-generation land seismic acquisition and processing system, METIS® (Multiphysics Exploration Technology Integrated System). The R&D program, led by TOTAL, aims to significantly reduce cycle times and optimize HSE performance while acquiring and processing 3D land programs in difficult areas worldwide, such as foothills regions, where significant “Yet to Find” hydrocarbons remain. As a METIS development partner, WSI provides the 1) real-time seismic recording infrastructure that supports 150,000+ channels required by METIS deployments; 2) high-speed, real-time radio telemetry system, based on next-generation radio technology from WSI; and 3) seismic recording channel called DART® (Downfall Air Receiver Technology) deployed from aerial drones. The DART recording channel is based on the same technology as WSI’s RT3 seismic acquisition system that delivers full, real-time data transmission for surveys scaling over 250,000+ channels. It features a new, two-tier radio telemetry architecture that supports totally flexible layout geometries, meaning that survey designs are no longer constrained to the “multiple 2D-line” geometries. With its fully automated deployment capability, the radio network forms and organizes itself with minimal user intervention. The DART enclosure design had to encompass and withstand many deployment and environmental factors when dropped from various heights. Details to consider included the type of path the DART would take when dropped from the drone and the force and angle of impact of the DART after impaling the ground. After evaluating 16 design combinations of tails and noses and 250 drops in open fields and thick canopies, the design combination that performed best was selected for the pilot test in Papua New Guinea. 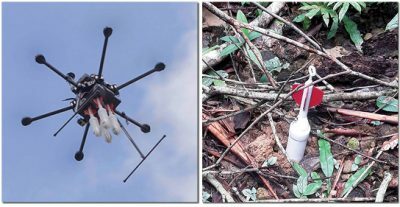 A drone deploying DARTs over heavy vegetation (left), and a DART impaled in the ground (right) in the foothills region of Papua New Guinea. During the pilot test, 60 DARTs were successfully deployed in only a few hours from a single drone, and real-time seismic data were recovered from the sensors, proving the method works. Ultimately, the DART size and weight will be decreased, and all DART components will be either biodegradable or environmentally inert to ensure a negligible environmental footprint. For the next pilot test in 2019, the goal is to deploy 4,000 DARTs on a 50m grid using swarms of drones flying in concert. METIS and DART are registered trademarks of TOTAL. WSI welcomes Lionel Lhommet as chairman, as Gary Jones steps down after serving as WSI Chairman for over seven years. Lionel began his career as CGG party chief on land acquisition seismic crews in Africa and later appointed as Director of Petrosystems/Flagship, dedicated to G&G processing and interpretation. He joined Paradigm Geophysical as deputy COO in 1999 and later founded PROGNOST Systems to develop artificial intelligence systems for downstream industries. Lionel returned to CGG in 2003 as R&D and strategy manager, joined the executive committee, and managed a staff of 3,200 covering all services for the EAME and APAC regions. He left CGG to work with Ivanhoe and Mithril private equity firms, supporting the development and market penetration of Kietta technology.